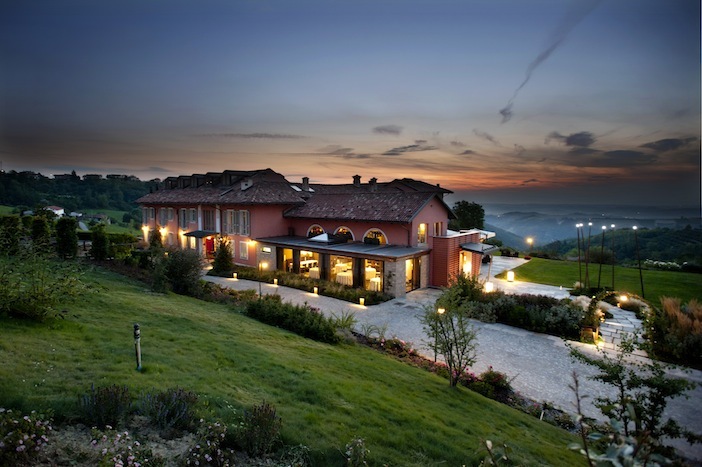 Yes, I am in Relais Villa d’Amelia, a restored eighteenth century estate in the heart of the beautiful Langhe region. It’s just gone midnight and the lights are suitably dimmed. The moonlight is streaming through the windows from the rose-fringed courtyard and the immaculate marble floor glistens beneath my feet as I stand shamelessly gorging on calorific hazelnut cream straight from the jar…with my bare hands. Classy. As I catch my nightie-clad reflection in the window, I see Nigella smiling back with a creamy grin – I getcha Nigella; sometimes a girl’s just gotta eat! You see the Italian province of Piedmont is a Mecca for foodies. Snuggled between the Alps and the Mediterranean, the areas fertile clay-rich hills are a treasure trove of gastro treats. Endless hazelnut groves hug its hilltops, ordered Nebbiolo vineyards cover its valleys and its forests are sprinkled with some of the world’s best truffles – yes, you only need two things on a trip to Piedmont; a camera and an elasticated waistband! The Michelin-starred Relais Villa d’Amelia hotel and restaurant is a ten minute drive from the lively city of Alba, the home of dolcetto and the prestigious white truffle. Sitting proudly atop one of the areas many hilltops it boasts hypnotic views and is the perfect base from which to explore the region’s countless medieval castles, quirky museums and picturesque hilltop towns. Known as the ‘gateway to the Langhe’ the River Tanaro splits Alba in two and marks the border of the Langhe and Roero regions. 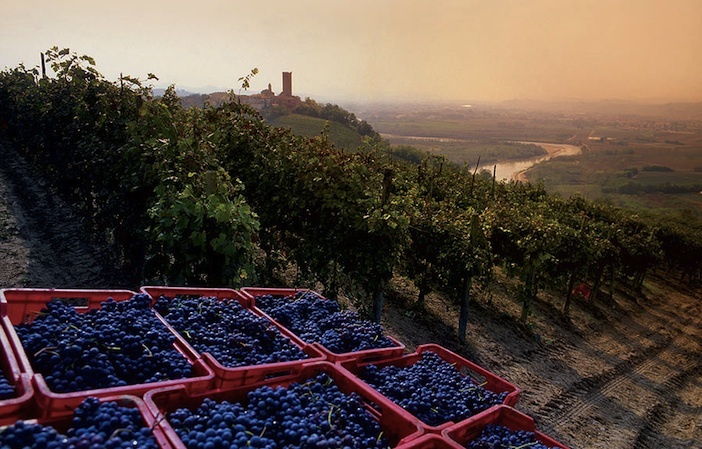 Langhe is home to Barolo, lovingly referred to as the king of wines by proud locals, whilst Roero is home to the wine of the same name and its gentle slopes are abundant with succulent peach trees and gleaming strawberries. Having enjoyed a decadent breakfast at this foodie retreat I headed off to explore the High Langhe area. Over the last few years this area has undergone a huge regeneration project, with many of the derelict farms being transformed into tasteful hotels and museums, whilst retaining their authenticity. After a short drive snaking around the patchwork hillsides, taking in the sunlit terracotta towns against the backdrop of the endless snow-capped Alps we turned off down a track which descended in to a fortress of hazelnut trees. At the end was a cheery farmer called Jose, who eagerly led us in to the tiny outbuilding he uses to roast his hazelnuts. The second we stepped foot in it we were hit by the nostalgic aroma of freshly baked cupcakes as he talked us through the painstaking process of selection, cracking, roasting and bagging, before leading us out to a sunny terrace to taste the nutty delights. “It is a local law that you must always try the nuts with wine,” informed his beaming wife as she poured me a glass of crisp rose at 11am and revealed an array of delicacies from straight up nuts and freshly baked cake, to refreshing gelato and their irresistible hazelnut cream, which goes from tree to jar in 24 hours – oh my, it was like sexed-up Nutella on acid. 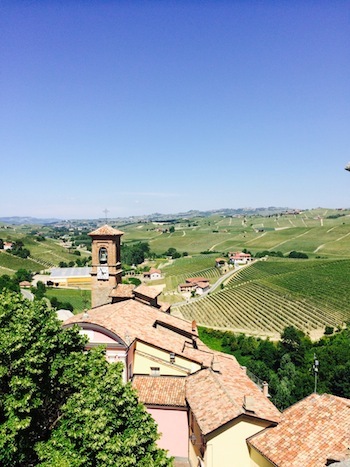 Having tickled my taste buds it was time to head to the medieval town of Barolo. Up until the nineteenth century, Langhe had specialised in sweet and sparkling whites, but today it is the powerful red, Barolo which takes charge. Surprisingly, the area actually has a French woman to thank for this delicious Italian concoction (much to its anguish). Juliette Colbert de Maulevrier was the wife of the Marquis of Barolo, upon moving to his county pile she sensed huge potential in the surrounding vineyards and wasted no time in introducing the Nebbiolo grape the town. As luck would have it, her new abode boasted a fantastic derelict wine cellar (well, whose doesn’t?) which she soon spruced up and today, over 200 years on, Marchesi di Barolo is still producing some of the finest wines around. Whilst a dusty bottle from 1859 lay proudly behind bars in a rack to my left, 2013’s harvest was maturing nicely in the enormous oak barrels to my right. The only thing left to do was to taste some and what better to taste it with than a selection of local cheese. The hour that followed was led by master cheese taster, Paulo Staccini; a man who I can safely declare is the most passionate cheese-lover I’ve ever met. In fact, he is one of the judges and organisers of the cheese Olympics – I kid you not! The second a piece was within sniffing distance his sincere face burst in to a smile as he sniffed, squeezed and savoured each piece, bite by bite, massaging it in the roof of his mouth to release the pungent flavours. 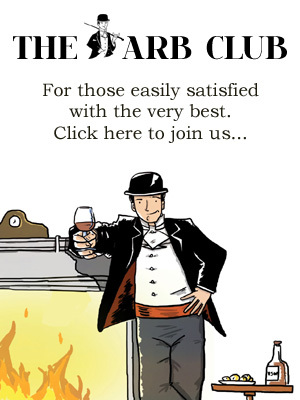 An effect which was mirrored in my Barolo tasting, I’m sure. Feeling suitably marinated we headed to Barolo’s 1000 year old castle, which today houses a museum of wine – but this was no normal museum. Having stepped foot in the glass bottle lift we were greeted by an amazing roof terrace boasting panoramic views of the meadows and peaks. Having instagrammed, tweeted and selfied our way around the rooftop we began our interactive tour. Now, I have often blamed Barolo for hallucinations and errors in judgement but this was taking it to new heights. The quirky interactive museum was a surreal collection of rooms which took guests on an educational journey through wine making. My favourite was the rain room, where I darted across a wall of water to reach the next stage of my journey and of course the secret wine tasting cellar. 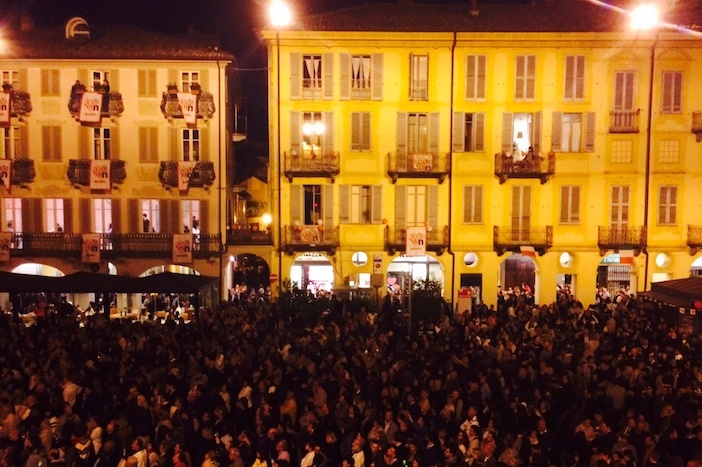 That night the city of Alba was calling as it celebrated 50 years of Nutella. Half a century ago, one of the town’s pastry shops experimented by mixing local hazelnuts with cocoa – and a legend was born. Part of the family-owned Ferrero group the chocolatey treat is a huge source of income for the locals and with 10% of them working for the confectionary giant it was time to party! 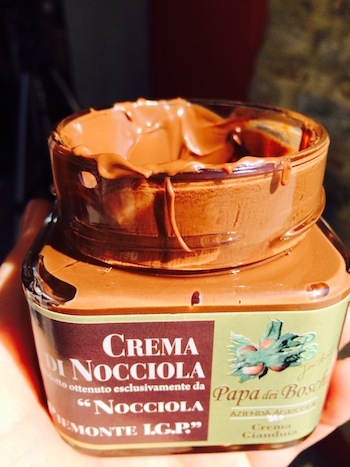 Now, I like Nutella, don’t get me wrong – but I had no idea just how much it meant to the locals. Thousands upon thousands of people descended on the main town square as an amazing gospel choir reverberated around the ancient walls as we stood there with our jaws on the floor soaking up the view from the town council’s balcony. Unsurprisingly that night my dreams were filled with rampaging rivers of chocolate, beaches of the finest ground hazelnuts and clouds of the lightest cream and once again as the moonlight streamed through my window like a ray of oozing caramel I found myself eyeing up Jose’s hazelnut cream. There was no way a 100ml liquids rule was keeping me from taking this gem home. A few hours later I was getting frisked by a burly security guard as I attempted to argue my case: ‘It’s not technically a liquidio – when it’s cold it is solidio – no? No, apparently that logic won’t stand up in court case on chocolate trafficking. We all have our downfalls, Nigella, we all have our downfalls. An overnight stay at Villa d’Amelia starts from £91pppn, including accommodation in a Superior Room, continental breakfast, complimentary Wi-Fi and service charge. For more information visit the website.